Our shop display window cleaning service will have your windows spotless before and after Christmas making your life much easier, as we take the handwork out of the festive window display cleaning up and all the spray snow and traditional sticky decorations left on your shop window after the festive season is over. Its a hectic time at Christmas with all the rushing around and having the best window display to show of your products or event. People in and out all day, kids looking and enjoying the window displays and also touching and kissing the glass as all children do. Gleaming windows with twinkling Christmas lights and snow spray in the display is sure to be used as part of most businesses window decoration. A great window display for Christmas will definitely bring the customers to enjoy and buy your products. Its after the events are all over that the hard work starts. 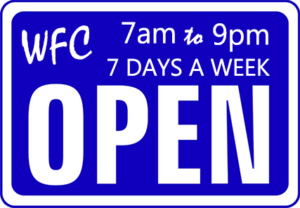 That’s where WFC window cleaners come in, as we know how to make every window clean and gleaming again ready for the next display. 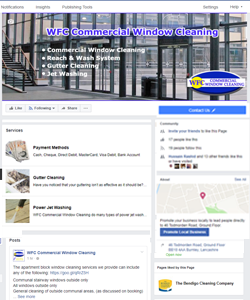 WFC Window cleaning also have a special window cleaning service to clean inside as well as outside of your display windows after the Christmas and New Year festive season is over. 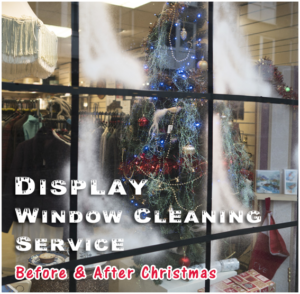 We know that your business display windows get dirty inside and out, especially over the festive season. Sticky fingerprints on your windows inside and out is in always a problem at Christmas and New year. If you want a professional to do your festive season business display windows quickly and safely, give us a call today and book us in to get the job done fast. We cover window cleaning in Burnley, Blackburn, Accrington, Clitheroe, Whalley, Padiham, Great Harwood, Darwen and the surrounding areas of Lancashire. If you are not sure about your area, just give us a call.